Supercomputers will be powerful enough to simulate the human brain within seven years, says founder of Top500 list. Supercomputers powerful enough to simulate the human brain will be developed within seven years, a leading supercomputer expert has predicted. 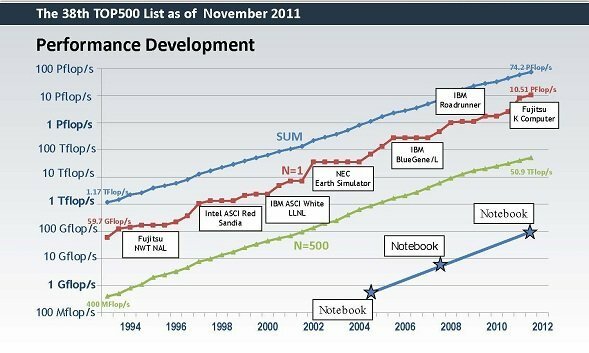 Professor Hans Werner Meuer, co-founder of the Top500 list of supercomputers, said that computers capable of processing a million trillion calculations a second would be available by 2019. These powerful machines would open new possibilities for simulation in medicine, weather forecasting, and aerospace design, Meuer (pictured left) told a meeting of computer specialists at the House of Lords. “Moore’s Law says you double performance every 18 months. The speed of the number one performing supercomputer is doubling every 13.2 months,” he said. Within the next 10 years, all supercomputers in the Top500 list will be operating at least at petaflop speed - a quadrillion floating-point calculations per second. And the most powerful computers, operating at exascale speeds, a thousand times faster than current machines - would be powerful enough to simulate the operation of the human brain, he said. Scientists expect to be able to simulate a rat’s brain, consisting of 100 million brain cells, within two years, Meuer revealed. “The end of the story is a human brain. That is [equivalent to] 1000 rat brains. That is where they need exascale computers,” he said. These machines will be able forecast weather in areas as small as 10km, and could be used to develop highly accurate simulations of aircraft aerodynamics, or make breakthroughs in medicine, the meeting heard. The technology is trickling down rapidly into consumer products. Within 13 years, consumer devices will be as powerful as today’s supercomputers, Meuer predicted. The Cray II ,the most powerful supercomputer in 1986,cost $22m. “Twenty-five years later, Apple came up with the iPad2. Like it or not, it's very close to the performance of the Cray II” he said. But Meuer said it was unclear whether supercomputers could continue to increase in speed at the current rate, as Moore’s Law began to reach its natural limit. “We are reaching the critical end, but when this end will be will be is still open. No one knows,” he said. Technologies, such as quantum computing, could give supercomputers a new lease of life, with IBM predicting the first workable machines within 15 years, he said. New types of supercomputers capable of crunching huge quantities of data rather than numbers, may also emerge to meet the demand for data analytics. 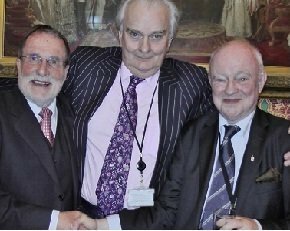 Pictured above (left to right) Professor Dr. Hans Werner Meuer, University of Mannheim; Lord Laird of Artigarvan; Kevin Cahill, BCS Fellow.